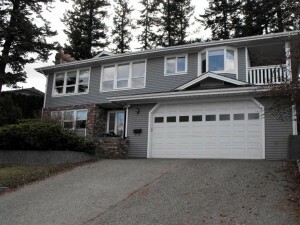 This attractive Aberdeen home is close to all amenities. You’ll appreciate the view from the bright open dining/living room. The spacious master has 3 piece ensuite & walk in closet. The kitchen features ample cabinets, large pantry & breakfast nook & there’s access to the covered deck from master & kitchen. The yard is private, great for entertaining with another big deck. Downstairs is 3rd bedroom, 3rd bathroom & cozy rec room with gas fireplace & there’s a hobby room/office off the oversized double garage. And its all topped off with a new roof! Note: ceiling damage in living room will be repaired by seller.